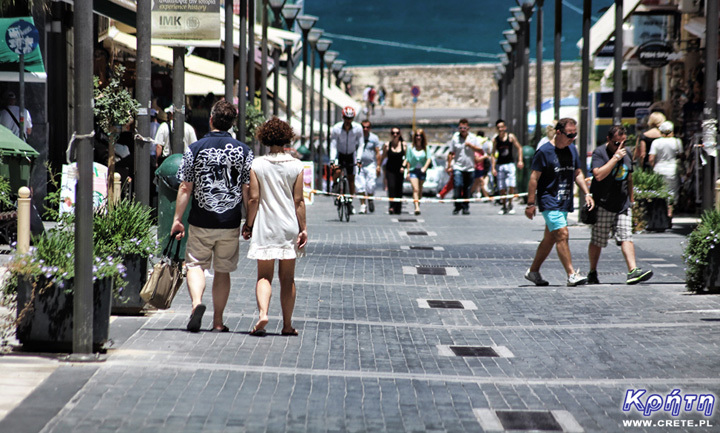 One of the typical paths that tourists visiting Heraklion are following leads through 25 August (odos 25 Avgoustou), which is one of the representative promenades of this city. Its beginning is marked by the square Elefterios Venizelos (Ελευθέριος Βενιζέλος), where the Morsini Fountain is located, and the end is the main pool of the old Venetian port. Going down this street towards the well-visible sea you will arrive directly in front of the Venetian fortress of Koules. It is one of the most characteristic monuments of Heraklion. In ancient times, it was part of the fortifications that once formed a sealed ring girdling the capital of Crete. Although today this building has only a historical function, it still perfectly reminds of the power of Venetians who ruled Crete during the period of splendor of this fortress. This fortress is a perfect example of Crete's multiculturalism. Located today in Greek hands, it was built by the Venetians, but is called a name taken from the Turkish language. Koules is derived from the words of Su Kulesi, which signify the Water Tower. Through the Venetians this building was called the sea fortress - Castello del Molo or Rocca a Mare. Unfortunately, the exact history of this place has not survived to this day. Certainly, some fortifications were guarded long before the current fortress of access to the port. On the basis of several surviving sketches and not very precise descriptions, we know that it was probably a kind of tower with a round or oval base, which was called castellum comunis . The oldest image of these fortifications was immortalized in the image of the Florentine monk Cristoforo Buondelmonti in 1429. 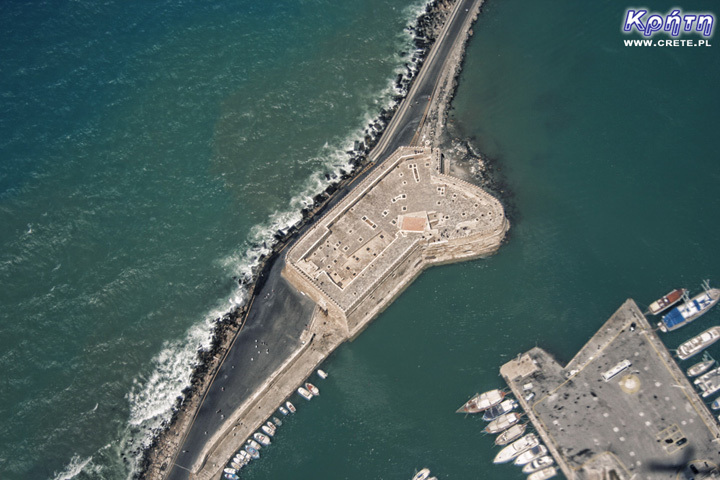 In 1462, the Venetian Senate approved a plan to build fortifications around Heraklion. A wide range of works envisaged in this ambitious project also included the reconstruction of the existing tower, which was far from the battlefield reality of Europe at that time. However, the Castellum Comunis, which was still rebuilt, lasted until 1523, when the Venetians finally exhausted the possibilities of further adapting the building. The port tower was completely demolished revealing a natural rocky platform. The current fortress was built here. Work on Koules lasted seventeen years until 1540. Long construction time should not be surprising when you look closely at the parameters of this fortress. The outer walls have a thickness of almost 9 meters, and the thickness of the internal walls reaches up to 3 meters in some places. The work also extended the strengthening of foundations permanently damaged by the sea. For the creation of breakwaters, the Venetians used an innovative technique involving the sinking of old ships filled with stones, which were obtained from the island of Dia located a short distance from Heraklion . The total area occupied by two wings of the fortress is 3600 m2. The slightly higher south-western part has a rectangular section, while the lower north-east has an elliptical contour. Three entrances led to the fortress, of which the western one was treated as the main gate. The other two entrances located in the north and south-west sides of the fortress were treated as auxiliary gates. Of course, the symbol of the Venetian Republic, the winged lion of St. Mark. These two bas-reliefs can be admired to this day. There are 26 rooms on two floors of Koules. Originally, in the lower storey of the fortress there were five rooms (casemates) in which the cannons were placed. On the ground floor there were also munitions warehouses, food depots and a prison. In order to ensure maximum autonomy in Koules rooms, there was room for a separate mill, bakery and even a chapel. In the upper tier of the fortress, rooms of soldiers and officers constituting the cast of the garrison were located. Although even from the perspective of today, the fortress seems to be a well thought-out well-functioning building, however, its design unfortunately suffered from many errors. Already in the initial period of use, it turned out that the arrangement of cannons in the lower storey was not a happy solution. Narrow shooting holes did not allow for good observation of the foreground, and thus it was not possible to conduct effective firing of the opponent. It is worth noting that the black powder used at the time by the artillery burned out, emitting clouds of black, acrid smoke. This was a very big problem, because after a few cannon fires this smoke tightly filled the cases, thus preventing the cast from performing further tasks. The only sensible solution eliminating this disadvantage was the transfer of cannons to platforms, which were placed on top of the fortress. Koules' weaknesses have also been noticed by Turkish troops, which from 1646 have besieged Heraklion for over 20 years. Already in the initial stage of fighting, this fortress was effectively eliminated by the Turkish artillery and the Venetians lost control over entering the port. Over the next several hundred years, the fortress, without major modifications, was also used by Turkish troops occupying Crete. During this period, the characteristic toothed finials of the walls, the so-called blanks, were expanded. On the upper level, a small mosque was built near the tower. One of the major changes introduced by the Ottoman army in the fortification system surrounding Heraklion was the construction of a smaller twin fortress called the Little Koules. This fortification was located directly on land next to the Venetian arsenals. Reconstruction of the street network of Heraklion, which was conducted just before the outbreak of World War II, forced the demolition of this building with a part of the Venetian Arsenal, whose remains can be admired to this day. Unfortunately, currently (as at the beginning of 2014), Koules is still not open to tourists. It's a shame because from the top of this fortress there is a beautiful panorama of the entire port of Heraklion . In previous years during the holiday season, the fortress could be visited daily from 8.30 to 19.00. The interior of Koules, except for very few exhibits, is completely empty, but the reasonably priced ticket price (€ 2) more than compensated for this defect. For our part, we recommend visiting this fortress ... of course, how the renovation will be completed. The fortress is located in the old port area of ​​Heraklion. Arriving by car to this place, especially on weekdays, may involve traffic in traffic jams, which are quite typical of the capital of Crete. However, if you decide to take such a step, it is definitely the best solution to enter Heraklion by the road leading to the new port. After reaching the intersection located just in front of its gate, turn left. Look out for free parking spaces, which are located further down this street, on the section before the visible from the distance the Venetian Arsenals. We suggest leaving the car here, and continue on foot. Please note that this part of Heraklion is subject to paid parking, so you do not need to pay for a parking ticket if you do not have to pay for additional costs associated with the ticket. A much better option will be walking to Koules from the central part of Herkalion . It is worth to attach it as one of the points of a trip around this city. Frangokastello is a small fortress that was built by the Venetians over four years from 1371. Initially, the castle was named after Saint Nikitas, but the local population, who did not like the Venetians, renamed the castle at Frangokastello, or the Franks Castle (a Catholic foreigner). The name was so good that in time the Venetians also treated it as officially in force.